Les Egralets with stunning views of the mountains is a welcoming, exceptionally spacious and comfortable apartment in traditional chalet style. The apartment is on 2 floors, furnished to a high standard and has the living space and feel of a ‘home from home’ stand alone chalet. Perfect location with access for the slopes, shops and restaurants. Les Egralets is superbly located just 5 minutes` walk (on the level both ways!) 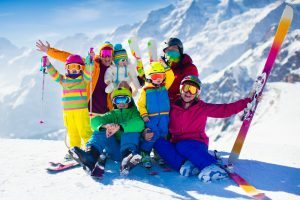 to the Super Morzine lift from where you have direct access to the vast and higher altitude slopes in the Portes de Soleil ski area of Avoriaz, Chatel and Switzerland. The Plénéy lifts for the Morzine Les Gets ski areas are easily located by taking the Petit Train which runs a regular service between Super-Morzine and the Plénéy. 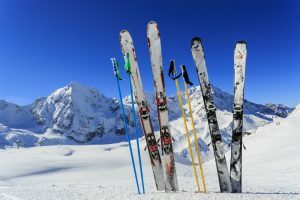 Hire skis or boots from Intersport at Super Morzine and they offer free ski and boot storage, so you can pop your boots and skis on and jump straight on to the Super Morzine or the Petit Train. The bus stop for the free Navette bus service is seconds from the apartment and runs between Morzine and the Nyon, Les Prodains and Ardents lift stations. The buses are free and a great way of getting access to all the key ski stations for Morzine, Les Gets, Avoriaz and deeper into Switzerland. There is ample ski and heated boot storage in the apartment if you are using the bus. This is the perfect location if you are keen skiers and looking for quick and easy access to all ski areas and making fresh tracks on those bluebird powder days! For any non skiers in your party the home from home atmosphere of Les Egralets is a perfect place for them to relax and enjoy their day, English TV, plenty of DVD’s, or take a lift or bus to one of the mountain restaurants and meet up for lunch. The new indoor aquatic centre with 3 pools including a baby pool, 3 saunas and 2 steam rooms is just a few minutes below the apartment via steps through the apartments’ garden to the route du Palais du Sports. 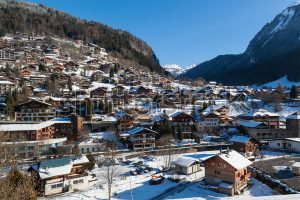 The shops, restaurants and bars in the centre of Morzine are within 5 minutes` walk making it a very easy to shop for supplies or enjoy the many restaurants in Morzine. This is the ideal accommodation for a couple of families or large groups. There is a fabulous open plan seating and dining area with large comfy sofas providing ample seating, positioned to take full advantage of views up and down the valley, for everyone to lounge and relax after the day’s activities. Enjoy dinner at the large rustic dining table overlooking the twinkling lights of Morzine and the mountains. Step through the French doors to the wrap around balcony for a ringside seat of the weekly fireworks display soaking up the mountain air and views, or weather permitting there is a table and chairs where you can sit with your post skiing drink. The large ‘ski room’ is a great space for children/teenagers to chill out and play games on cosy fur lined sofas leaving parents to relax in the main living area. The room has a dedicated space for skis and heated area for boot storage so boots are warm, dry and easy to put on to start the day. The kitchen is large and well equipped for cooking family meals, with an additional dining table – particularly useful if you have little ones you want to feed and keep an eye on as you’re cooking. On this floor there is also a shower room and separate wc. Upstairs the 4 bedrooms are unusually spacious sleeping 9 guests with space for a cot in the largest bedroom. The beds are extra long singles and have super comfortable mattresses which can be made up as twin or kingsize providing plenty of flexibility for families and groups, with warm duvets, linen sheets and snug fur throws. 2 of the bedrooms enjoy views of the mountains and valley and another has it’s own balcony. Upstairs there are 2 contemporary bathrooms, 1 with large walk in shower and 1 has a large bath for easing aching limbs. And always plenty of hot water. The apartment has its own private entrance and a private parking space by the door which is very convenient for unloading bags! Apartment Les Egralets	standard bookings run from	Sunday	to	Sunday. We thoroughly enjoyed our stay at les Egralets. The apartment, which really feels like a chalet, is welcoming and warm, nicely decorated. It is spacious and the boot room is a real plus. The location is great as you can easily walk into town, even with small children. The view is also great. The beds are very comfortable and the heating works nicely. We absolutely recommend Les Egralets. Apartment Les Egralets is perfectly situated for easy access to the Super Morzine lift. I would recommend hiring and storing equipment from Inter Sport near the Super Morzine Lift then you can hop on the little train to get over to Pleney. The accommodation is very clean, spacious, tastefully decorated and well equipped. Lovely views over he valley. Great entrance room for storing and drying equipment. I would highly recommend the accommodation and the efficient and friendly services offered by your team. Thank you Alptitude! We were really impressed with the apartment. It was very spacious - plenty of space for our toddlers to run around downstairs, and upstairs all of the bedrooms were a decent size - no box rooms! Location-wise, it is a short walk to the super morzine lift - perfectly do-able in ski boots every day. The view from the balcony is great over the valley. Recommended! Our family have just returned from a wonderful Christmas break spent in Morzine staying at the Les Egralets apartment. The accommodation was excellent, the beds were very comfortable and the lounge and dining areas most spacious for our family of 6 adults and a two year old. The kitchen was the best equipped we have ever enjoyed and the bed linen and towels were of excellent quality. The apartment is very well situated with easy access to the shops, restaurants and ski lifts and has the most fantastic views. It looks out over the river and across to the new Pleney bubble lift enabling us to watch the lantern lit ski procession and firework display take place on Christmas Eve from the comfort of our armchairs! Wonderful! We had the most fantastic time and hope we may be able to return again some time in the future.